a good life. : A rough day ahead. 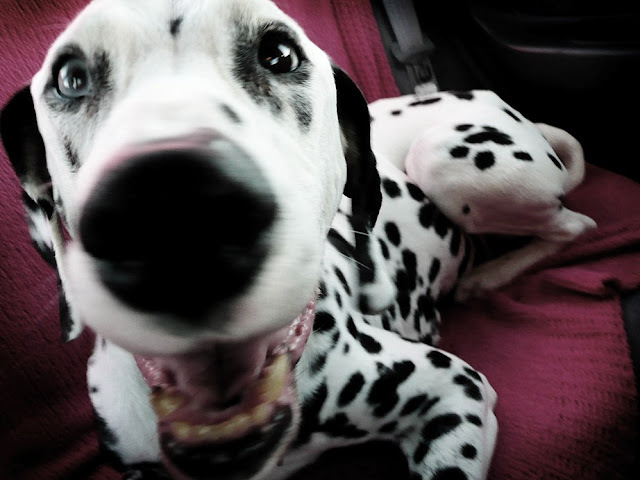 Well, there are many of you reading this who have had the privilege of making the acquaintance of my little spotted friend, Dominoe. Unfortunately, he's gotten pretty old and life isn't so fun for him anymore. We think he's in a lot of pain, although he doesn't really show it. But I reckon that hardly being able to walk and falling when you try to run just can't be a good time. He's pretty much lost all control of his bodily functions which makes living with him pretty hard, but what he lacks in cleanliness he makes up for in personality and love. I think that's what's gotten him this far. This dog has the biggest heart in the whole world... He's gotta be in a whole lot of pain, but he would never let us know it. He still makes his crazy "Chewbacca" sounds when we come home, and wants to be nowhere else except exactly where we are. Even as I type this, he's curled up at my feet not having any idea where he's getting loaded up in the car to go do in about 1/2 an hour. Our appointment with the vet is at noon today, and it's not gonna be easy. For us, anyways. I know how peaceful and painless it is for the dogs but our pain doesn't go away near that fast. It's gonna be much much harder on us than him. That selfishness is also probably what kept him alive this long... why have we kept him alive this long to be in pain when he walks, when I'm sure he'd much rather be running? He can barely make it down the stairs off the back porch to go do his chores without falling. But every night after his 7:30 dinner, he's standing at the front door waiting to go on his walk. He's given me 13 amazing years... that's more of my life with him than without. I got him when I was 12, and he was my 4H dog for 4 years. He's always been such a show stopper, and everyone stops to look at and pet the Dalmatian. He takes it all in stride... it's just another day of being a gorgeous dog. He's given us so much unconditional love, and I couldn't ask for any more loyalty out of anyone. I know he's going to a much better place, where he can run and jump again and play with Kody, Lucky, and Barry. Ok, I've got to go... thanks for the support everyone, we definitely know he's in a better place and I am already excited for him to find his running legs again! Our thoughts are with both of you. We had the pleasure of knowing Dominoe and he was a great dog...a little stinky when he at the "people" food...but still a great dog. We hope you find peace in knowing he is no longer in pain. We love you guys, keep us updated on yourselves and let us know if there is anything we can do. I am so sorry this day had to come. It's so hard when our good friends pass on. He was such a good dog. I am thinking of you and Sam and will be thinking of Dominoe. Oh Amy. This is hard. I'm crying right now remembering our walks with him and picking up his poo, drawing colorful spots on him, snuggling with him. I love you and feel better soon. Makayla was "reading" over my shoulder. She suddenly exclaimed, "Look! It's Dominoe. He's smiling." And I bet he really is. Amy, I'm so sorry. It breaks my heart to hear that. He was an amazing and fun dog. I have lots of good memories with him. Remember when we drove back from Seattle together with him in the back? I still have dog hair in my car from that! What a good guy. I love you. We are thinking about you guys! Gosh, now I am really bawling.